Huge thank you to Perfect.Murder, @object29, @sleazymartinez, @MrJohnLogan and everyone else who helped with the setlist & reports. Real team effort tonight. #2 - The Reverend "Reevito"
Robert interview/Cure article in the new issue of Hot Press.You can buy a copy here. Update: Posted some photos of this great interview here. "There are now 3 half-albums on the go! We were going to record this week, but I've been mixing all the live shows for a DVD of this Summer. We'd love to do something with Reeves...there's a lot going on at the moment with The Cure, but it's all historic. I've been doing the Wish re-master for what seems like 15 years - Kevin Shields is my role model in that department! There's a compilation coming out and a Mixed Up 2 project. I've just done something for Tim Burton's Frankenweenie & I've a couple of other collaborations in the tray marked 'pending'. There's going to be a glut of Cure stuff when they all arrive at the finishing line at the same time. Another Cure thing that's ongoing is a retrospective 4-hour DVD and accompanying book." Full text from the Radio Times: "After the bonanza of Olympic coverage, the BBC returns its interactive service to what it now does second-best: providing extended coverage of music festivals. 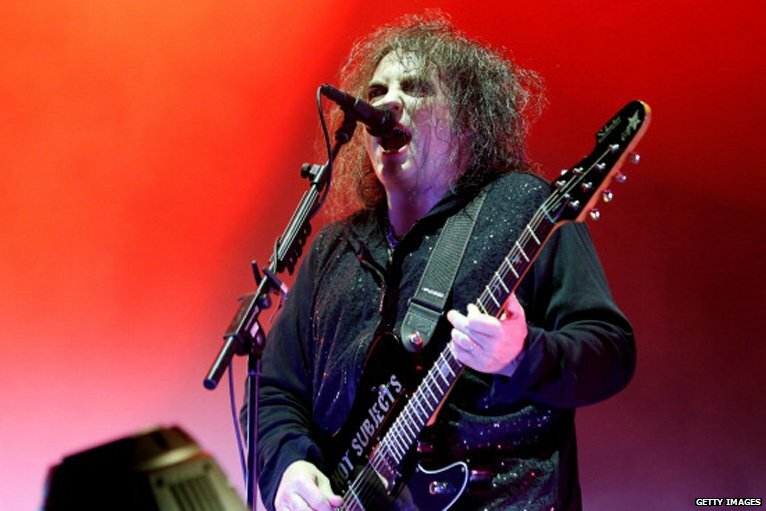 So while you can catch the first hour of an exhaustive set by Reading headliners the Cure on BBC3 from 9pm, press red at 10 to continue enjoying the pop goths’ triumphant return to a festival they haven’t played since 1979. If you’re a satellite or cable viewer, you’ll also be able to choose between bands on the main three stages. BBC3 has lively Swedes the Hives and inexplicably popular US plodders Paramore at 8pm, plus more from the Cure at 11.30pm, and the Maccabees." Update (Aug. 22nd, 2012): The BBC has put up a page with all of the various channel info here. Feel free to spread the information widely. If you need to contact me, here's mobile phone # : 0033 6 62 11 28 82 ; and my email address : fargierdavid(at)yahoo(dot)fr . david after the rain / après la pluie / nach dem regen / despues de la lluvia / depois da chuva"
From @matt37797: "In honour of this weekend, uploaded The Cure at Reading Rock 1979 to YouTube. Audio recording with stills from the event (images from ukrockfestivals.com). This is a bad quality audience recording of The Cure at Reading Rock festival 1979, but the only one in existence! Probably done with a cassette player while sat in the field!" 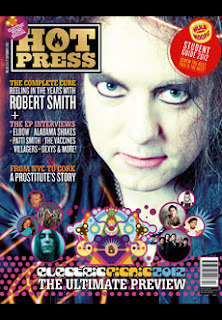 From Warren: "I've put together a quick Reading Festival Guide for Cure fans. It's a work in progress. Tweet me on @waswasere if you're in town or have more questions." From NME: "The organiser of the Reading And Leeds Festivals has spoken about this year's event and how pleased he is to have secured The Cure and Foo Fighters as his headliners. 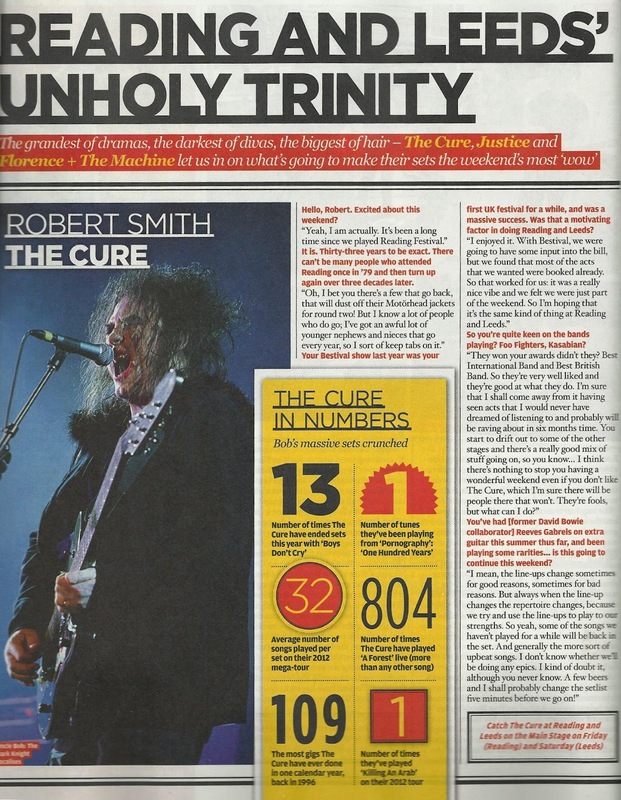 Speaking to NME in a video which you can see at the top of the page (Note: which in typical NME fashion, is actually at the bottom of the page), Melvin Benn has promised that The Cure will be "a real treat" and has said he regards securing them as a real coup. Asked about booking Robert Smith and co, Benn said: "We're really pleased that we got The Cure to play. Robert Smith is not somebody who just wants to play for the sake of playing; it has to be the right time to play. They're a hugely important band to what has been British rock and roll music. It'll be a real treat."